A number of environmental factors can contribute to the deterioration of books and paper. From molds and mildews to bookworms and silverfish, environmental factors are often exacerbated by changing climates. Temperature and humidity encourage not only the proliferation of hungry critters and microorganisms, but destructive chemical processes inherent to the physical composition of paper. Acid from the paper-making process or ambient pollutants, such as those rising off of Lake Shore Drive, induces these processes and can be agitated by weather change. Depending on the percentage of relative humidity, the paper in books may undergo a process called cross-linking (caused by too low of a humidity) or hydrolysis (caused by too high of a humidity.) These chemical changes make the fibers in paper very brittle, which in-turn causes the paper to become yellow and disintegrate. Benzaldehyde, an aromatic chemical with an odor reminiscent of vanilla, almonds and rotten leaves, is released during this breakdown and is responsible for “old book smell.” Humidity levels also contribute to a phenomena called “foxing,” which refers to the development of red or black dots on the surface of the paper. Like many collections of its kind, the Thorek Medical Manuscripts and Rare Book Collection (also known informally as the Museum Library) is not a climate controlled space. 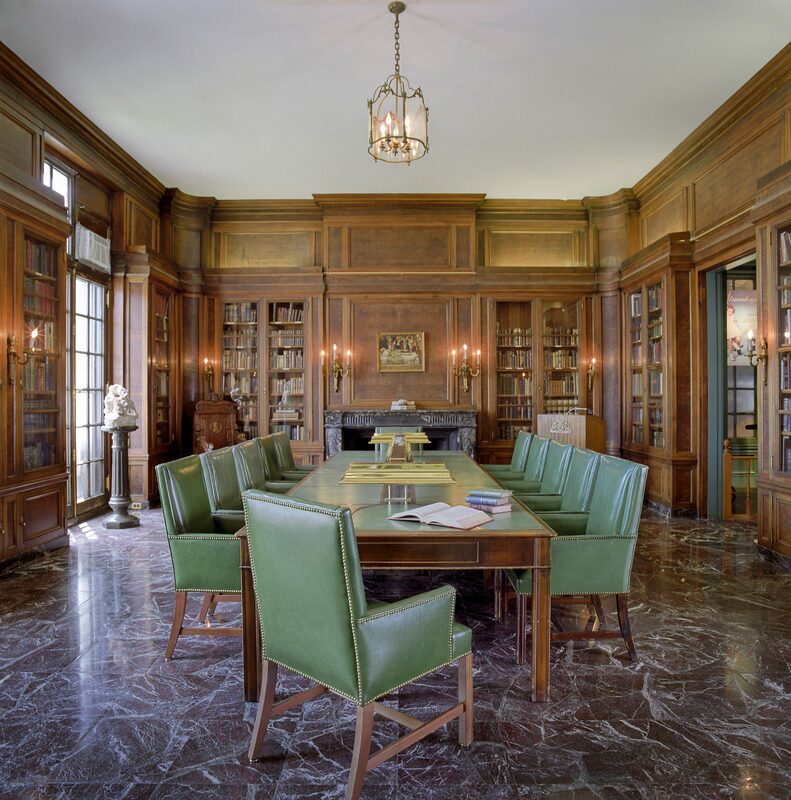 Like the rest of the Museum, this library relies on window units in the Summer for cooling, and the same central heating system installed in the house when it was built over a century ago for warmth in the Winter. 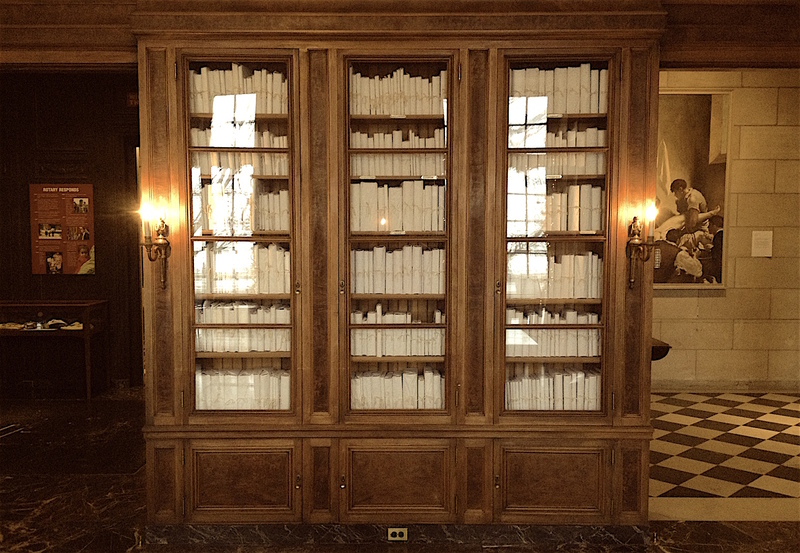 These factors raise serious concerns related to the library’s longevity and condition. While climate-related damage cannot always be reversed, the processes involved can be slowed and sometimes stopped entirely. 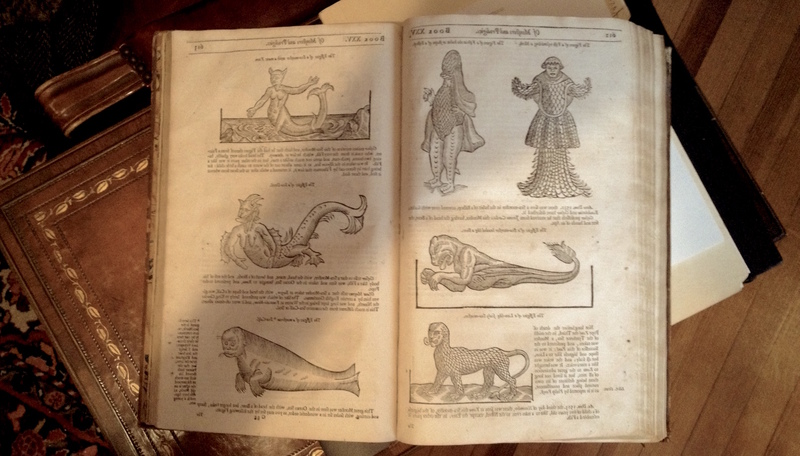 “The Collected works of Ambroise Pare,” from the Museum Library, translated to English from French. This copy dates to 1634 and is open to Book XXIV, “Of Monsters and Prodigies,” a treatise on defects of birth. Conservation is a core value of any Museum, but the associated costs can prove overwhelming for small to mid-size organizations. Where state-of-the-art provisions may not always be affordable, or clash with other historic preservation concerns (historical architectural accuracy, material preservation, etc. ), simple interventions and education can be a critical first step in preserving cultural heritage. With collections of books, this can be as simple as soft-packing or wrapping a volume in tissue, as we began to learn here at the Museum early last year. Last Winter I was approached by Laura Chaillie, a close friend of many years and graduate-candidate in Conservation Science at the University College London. Laura had previously held a two-year appointment as Pacific Collection Conservation Intern at the Field Museum of Natural History here in Chicago, and was always a joy to talk shop with. Knowledgeable and creative, with a strong DIY spirit, Laura loves grass-roots solutions to complicated problems. After discussing the major issues facing the Museum Library – including limited physical and intellectual control, as well as climate related damage – Laura devised a elegant, smartphone enabled protocol to tackle issues of indexing and conservation. A once monumental problem started to appear digestible. In April, Laura hosted a kind of “summit” at the Museum, bringing together a group of 14 volunteers from various backgrounds (most with no experience in a Museum conservation setting.) Laura started the day long summit by instructing the group on basic conservation principles, condition reporting across five book-specific areas of concern, cataloguing principles and applied conservation. The rest of the day was spent test-driving Laura’s protocol. Using acid-free tissue as a buffer between the books and the outside world, volunteers began the process of slowing damage caused by acid-related breakdown. The simple tissue buffer works by filtering pollutants and stabilizing internal humidity levels. The speed at which the group worked was extraordinary, and in under 5 hours over 6% of the Library had been indexed for searchability and soft packed in tissue for long-term safe storage amidst the fluctuating climate. This work has been continued by Monica Stokes, IMSS Library Conservation Intern (Fall 2016 – Spring 2017), who at a commitment of 1 day a week since October of last year has brought indexing and soft-packing in the library to over 20% completion! 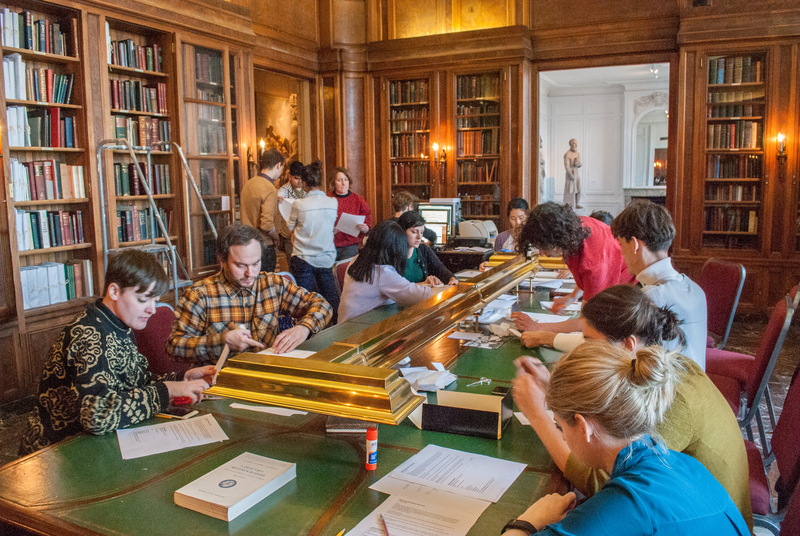 With these workshops, we are seeking to emphasize the Museum as a leader in creative solutions to core problems facing collections at organizations of our kind and scale while creating opportunities to educate the public and invest in Chicago’s community of museum enthusiasts by teaching from our collection. Volunteers from all backgrounds are welcome, and no previous experience in conservation or library management is required. For more information about these workshops or to register, please visit the Eventbrite. We at the Museum are looking forward to updating readers of this blog on progress in our library, as well as across our various other projects. Monica Stokes will take up writing from the helm of our library conservation initiative, and will present monthly highlights detailing interesting finds as we work through over 1000 rare books from the history of medicine. Stay tuned!